When there is no cap in the head, the thought in the head is strange. This is a decent, atmospheric opener. 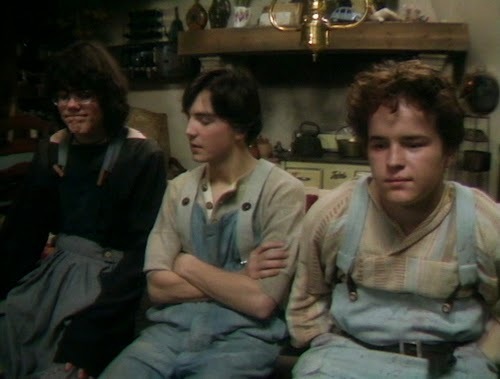 There’s a slight The Wicker Man vibe to the blithe “sacrifice” of youth to the Tripods, and in retrospect the Will/Henry dynamic has something of a Frodo/Sam vibe (just a much grumpier, dyspeptic Sam). 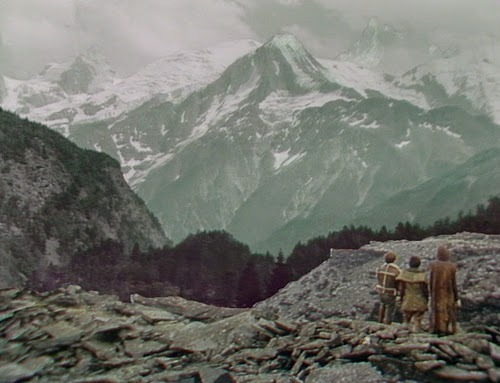 So too, the classic perilous journey through a treacherous landscape is familiar (to a place “where men are free”). Ozymandias (“I’m king of all this land”) is an explicit nod to all we lose through capping (a creative mind like Shelley’s), and entertainingly performed by Roderick Horn. 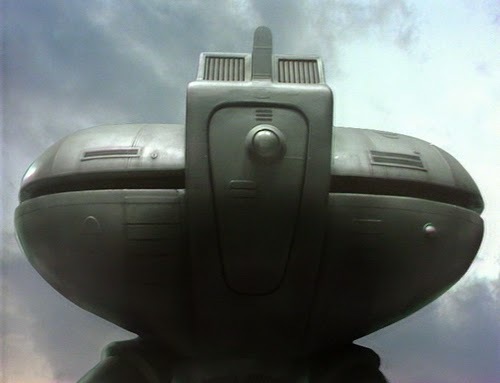 The pieces are all there in the set up; disgruntled teenagers (“Why do I have to be capped?”; it’s so unfair) and the mantra “We thank the Tripods”. Will’s unseen friend paints no more since she’s been capped, but really the disincentive comes from the sight of Jack (Michael Gilmour) being taken aboard the Tripod and coming back with a nice metal triangle on his bald bonce. Jim Baker sets the store for the next 12 episodes by moaning a lot; on one level he’s your classic petulant teenager, on another he could put a bit more welly into it. This isn’t bad, but we’re already getting diminishing returns. 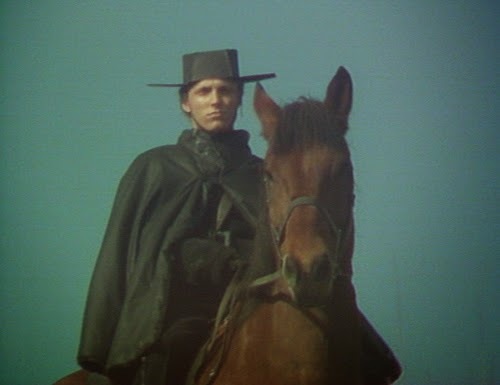 Lots of running and horses and synths (are the villagers going to strong arm Will and Henry back if they find them; a bit aggressive if so). 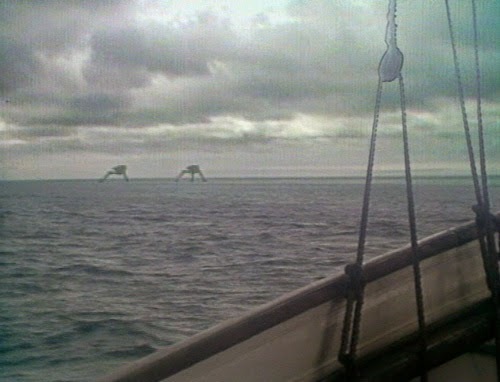 The Tripods don’t seem to have much in the way of effective surveillance tech on board, as the duo are able to leg it while it’s back is turned. We’re warned again of the perils of the journey (one, maybe two out of every 50 make it; that must be why there’s hardly anyone at the White Mountains in episode 13). 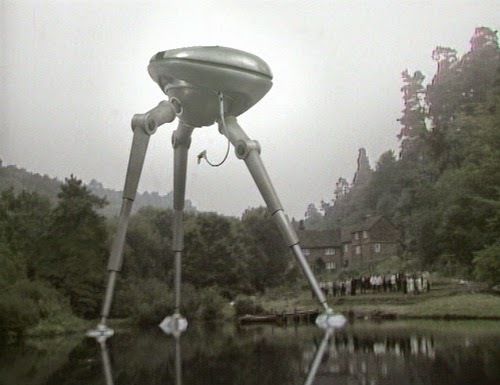 The Tripods still permit alcohol, which is dumb (particularly given the events of the third book). 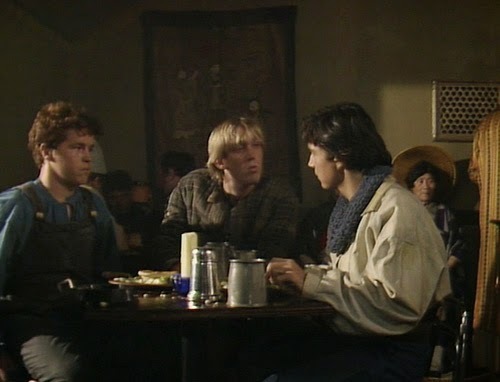 The pub scene, and general threatening nature of the harbour is effective, but you wonder how nasty it would be if this lot weren’t capped (how many of Captain Curtis and his crew are capped is debatable, but since the Tripods can cross the channel spot checks are obviously a danger). There’s a nice atmospheric bit in the pub where Ken Freeman contrasts the typical piano contrasts with sinister synths. The cliffhangers in this series are often mush. The last one saw Will and Henry with a trip to Africa. Oh, the relief when they find it was Captain Curtis’ boat all along. Already, the series seems to be faltering with its options. Arriving in France, Will and Henry are promptly captured (Henry is peeling potatoes to earn a crust, the ever-hungry oaf). “You will be capped tomorrow. A Tripod is here. It is the law.” Except in a few episodes, when the Count begs to differ. Fortunately, Beanpole makes his entrance. He seems to have devised a remarkably effective ruse for evading capping; he simply pulls a sickie on the designated day, and presto, the event remains ever distant. Evidently an indicator of the guilessness of the capped and their masters? 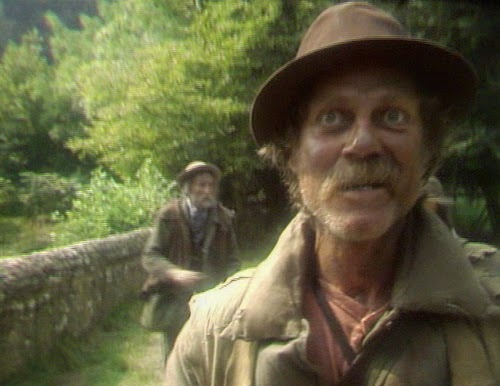 Beanpole is actually called Jean-Paul but, rotten English boys being rotten English boys, they instantly pick on his distinguishing features and mock them. Our heroes. The escape is remarkably easy. A watchable, unremarkable episode, and slow; a sign of things to come. 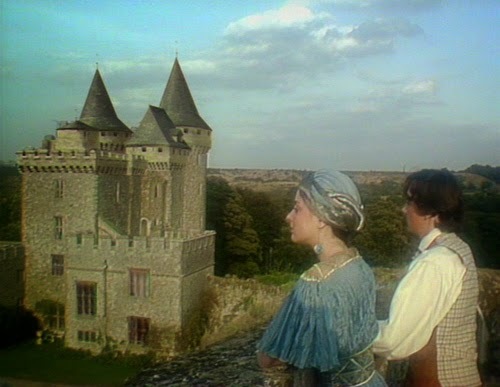 The last respite before an inordinate stay at Chateau Ricordeau, the main problem with this episode is that great opportunities are allowed to drain away through perfunctory production values and direction. 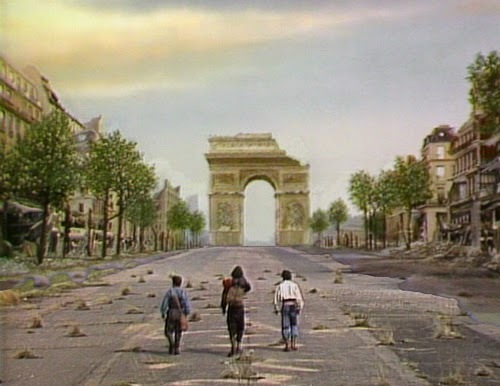 A visit to a decaying Paris, with all the long-lost secrets it holds, promises much, but it devolves into a few projected backdrops and some dodgy extras lobbing rocks (and the lads lobbing hand grenades). Along the way the boys hitch a lift on a handcar, examine a 2CV, and Will spends an awful lot of time looking at their map (good prop acting, or simple desperation?) And then, at the end. Oh dear, the Castle beckons. 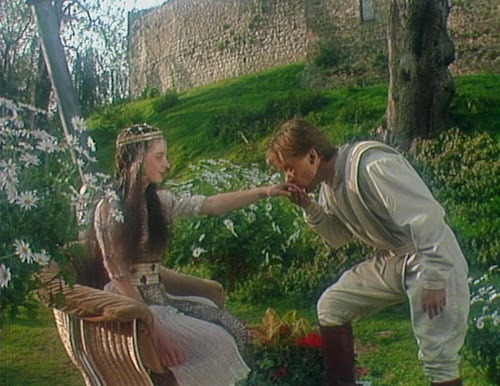 Will’s wooing of Eloise, or vice versa, finds the series taking a cloying turn, particularly when he saves her from a certain drowning in a calm pond. 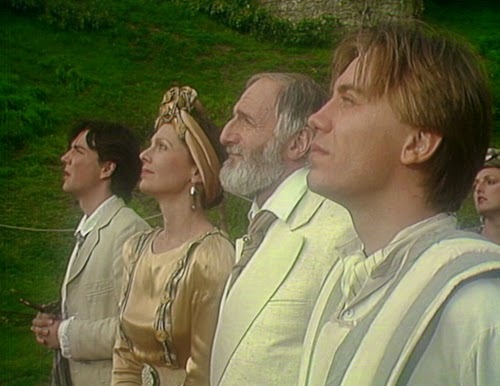 “We wish you for a son” announce the Count and Countess (she’s very tactile with Will, but then she ismarried to an old codger), seemingly happy to taken in an English hooligan and his reprobate chums. How dreary. “She’s trapped you better than any Tripod” accuses Henry. And we’re trapped too, stuck at the lazy Chateau while the trio squabble about what to do next. Henry is at his most petulant during a pool party, and really ought to get a good slap. The only alleviation from boredom comes near the end. Will dreams of a Tripod looming over the Chateau grounds and lo, one has arrived come morning. Just when you were giving up on them for good. Then there’s Eloise revealing her cap. Next episode Will understandably, wonders what difference it makes. I mean, it’s not like she’s a collaborator or anything. She seems perfectly normal, living in a romantic dream in occupied France. The tournament episode, and a low point in the season’s hardly high-shooting course. By this point, the persistent (virtual) moustache twirling of the Duc de Sarlat is becoming as tiresome as wet Will. 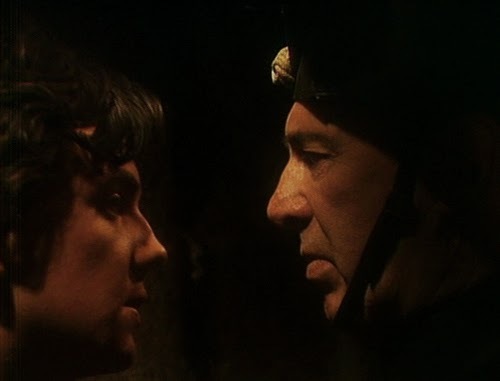 The former draws blood during a fencing contest and gets a bit brutal in the joust, while Will has an argument with a fat man (Roger Hammond as Count de Saclay). 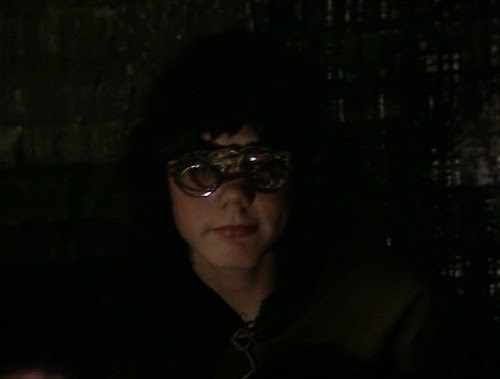 Eloise being chosen as Queen of the Tournament and disappeared into the belly of the great metal beast is effective, but at this point, you’re wondering how on Earth the series staggered made it to Season Two. This is more like it. 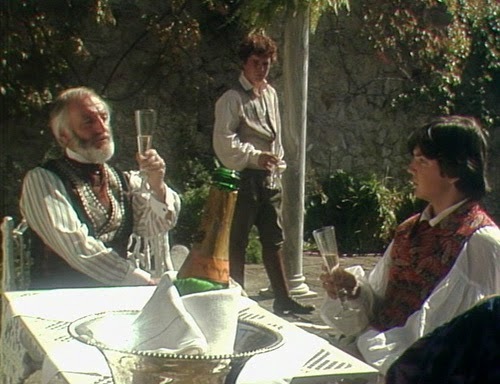 We start off at the Chateau, but with his amour gone it’s not long before Will is too. He encounters his recently departed pals remarkably easily (it’s a small country, France). The did-he-or-didn’t he of Will’s encounter with the Tripod is intriguingly maintained until he reveals “the thing” in his side. 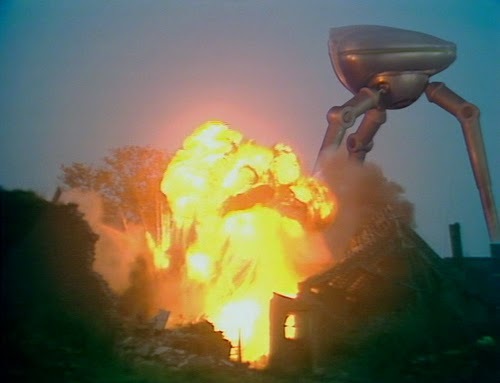 One wonders if Spielberg checked this episode out before shooting the scene in War of the Worlds where the characters are similarly besieged in a house by a metal machine. Not wanting to side with the rouge tool, but Henry has a point when accuses Will of dropping them in it. 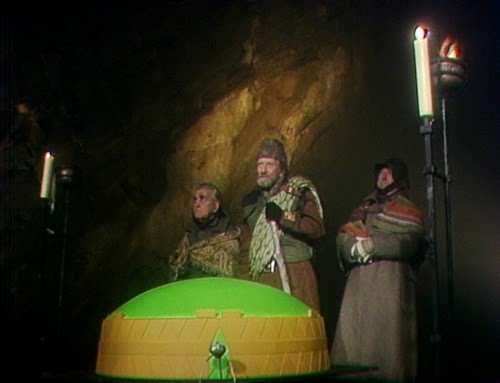 There’s increasing speculation about the ways-and-means of the Tripods (why it’s tracking them, Will speculating that someone is inside it) and the first glimpse of the City of Gold. Oh dear. 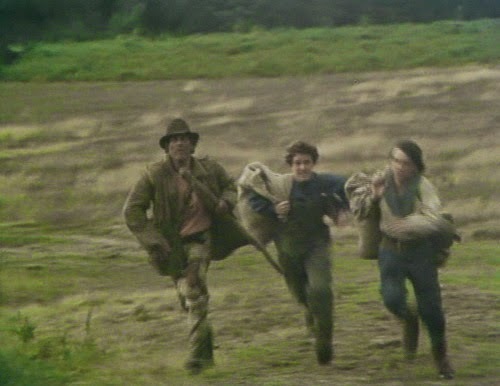 An effectively unsettling beginning, as Beanpole cuts out the tracking device and Henry runs off squeamishly. 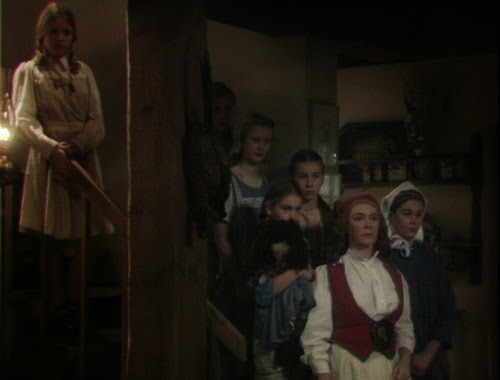 But then the trio get bogged down once more, this time with a wee Scotty woman, her dim French husband, and their six daughters. So now we’re treated to the lamest of reversals; Will wants to carry on to the White Mountains while Beanpole and (especially) stroppy block of wood Henry are keen to stay (no wonder, only girls chomping at the bit for boys would go for them). More enthralling activities at the vineyard. At least there’s a vaguely philosophical scene in which Madame Vichot muses on why her capping didn’t fully do the business, but there’s also much in the way of tiresome romance and spurned emotions. At least they’re out of there by the end of the episode. Its just as well this bunch are so inept or they’d reach the White Mountains in no time. They are unable to pull off a food theft at a harvest festival (fat hungry Henry makes a noise) and escape to the vagrants’ loony woods. It’s an interlude bursting with potential that makes next to nothing of it; the spectre of the Knights who say “Ni” is summoned, only not in a good way. Worse, when Will and Beanpole trying to act m-m-m-m-mad its quite embarrassing to watch. From there, it’s back into the lion’s den and yet another threat of capping to finish the episode. When it comes to missed tricks, it might have been interesting if the dogged pursuit by Vass Anderson’s Black Guard (who has the unflinching demeanour of a less unnerving version of the egg-sucking German in A Fistful of Dynamite) had given way to the reveal that he was only after them because he’s only pretending to be a guard. 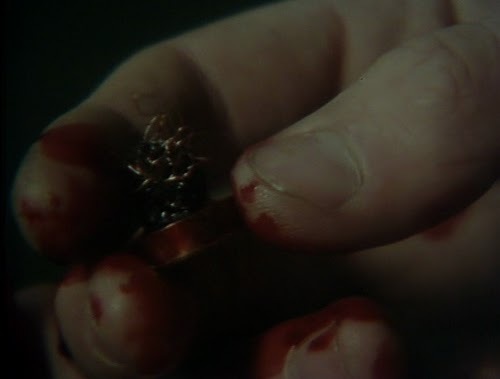 Christopher Barry, who took over duties on the eighth episode, does a bang up job here, first with their besting their captor and then the encounter with and assault on the Tripod. 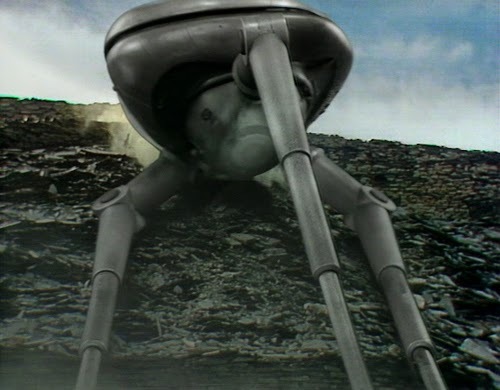 Henry suggests the Tripods carry people after “heroically” blowing it up (he probably hoped to discover a sandwich just inside the door), so he’s talking garbage. 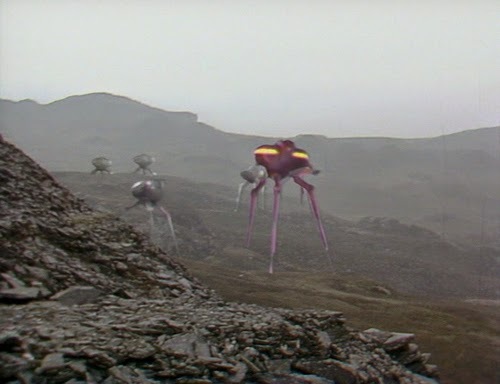 Excellent cliffhanger for once; a model shot showing five of the metal beasties on the warpath, including a purple number with machine gun emplacements leading the way. 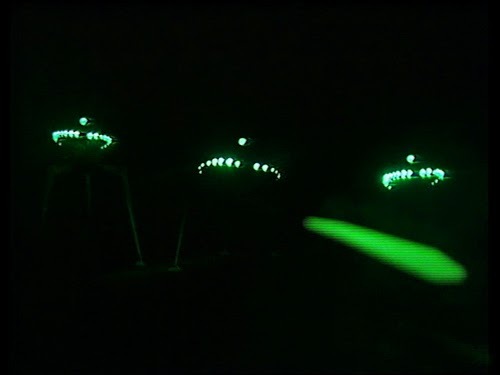 The Tripod action is dispensed with early on, which is a shame as it’s particularly well staged; all glowing green lights in the darkness and laser bolts. The events that follow can’t compare but they keep their dramatic end up, with the trio apparently apprehended by black guards and interrogated. Peter Halliday makes a memorable inquisitor and there’s a welcome return for Ozymandias. 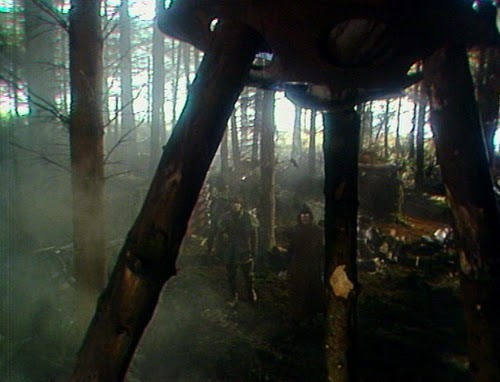 The Tripods are revealed to be especially cunning, with the capability of sending those unknowingly conditioned to join the free men. 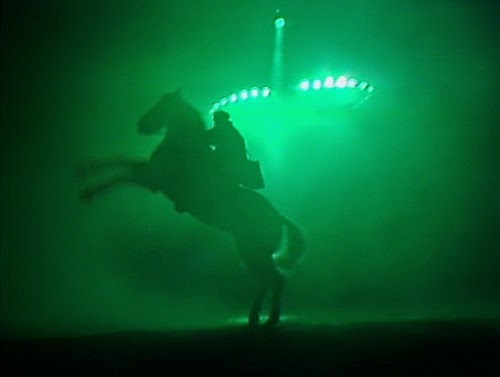 Which begs the question, if the Tripods can both infiltrate and lift knowledge from those they capture, how the free men have survived so long (they aren’t exactly a hard-bitten resistance movement). The final scenes are less surefooted, with the reveal that all (youthful types) will be coached in sports so as to inveigle themselves into the City by winning the annual games; why not train them in combat too, just to be safe? And of course, all 20 of these callow youths stand up to be counted at the end; a little brainwashed fervour goes a long way. The vibe is heavily fromage-soaked, while the model Death Star/City of Gold, as mentioned elsewhere, looks like it was rustled up with some cereal packets and double-sided stick tape (there’s even a thoughtful scale model of a Tripod to complete the effect). WOW what the write up. 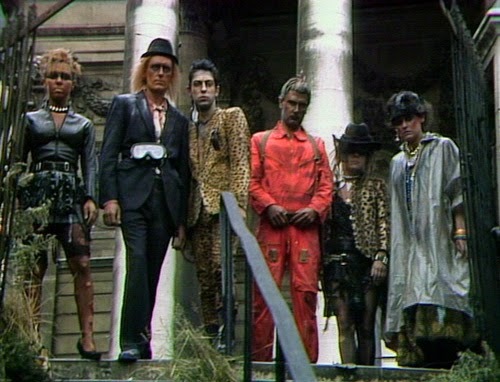 If not already a member you should wonder over and join the League of Freemen, the official BBC Tripods fan club.